It's Here! The Event Planning Guide eBook is Now Available for Purchase! ​I cannot believe it is April and the Change of Gavel has occurred. I thought maybe the new President – yes, that’s me – should have the immediate Past President draft a few articles to get the ball rolling in the 2016/2017 term. Then I remembered Beth’s words of wisdom: “just get started.” She said she found inspiration in both the likeliest and the unlikeliest of places each month. So here is the start of my term, and I wonder what it is that I can share with all of you that is unique, special and insightful. I admit I have not figured that out yet, but I can say we are all in this together. If each of us does a small part to make the lives of a peer better we can move mountains. As administrators we juggle a thousand things a day. I would ask that we each toss one more ball up in the air and figure out what we can do to be involved. Try to remember why you joined the Capital Chapter. Often, it was with the best of intentions to network and learn and even just to socialize. Take those moments, make those connections, find a way to be part of something that at one time or another has helped each of us. In my comments at the Change of Gavel, I said that I wanted my term to be marked by inspiration, leadership, compassion and most of all a healthy sense of humor. In the months to come, I hope to cover them all – and many times, simultaneously. Join me on this journey. Help me meet, reconnect and laugh with more of you each month. Let’s figure out together what the 2016/2017 Capital Chapter can do. We already have the commitment to juggling from the Executive Committee and the Leadership Team, along with many of you that have accepted the challenge to be an Ambassador. To each of you, you have my heartfelt gratitude. I look forward to the connections and the new memories we will make. Now, back to my idea of a ghost writer for these articles…. The Chapter extends its condolences to Marilyn Mickelson, a past Capital Chapter president, on the passing of her husband of 40 years Nick. At the January 2015 meeting of the ALA Board of Directors, the Board unanimously approved making two changes to the ALA bylaws and, as required by their bylaws, those amendments were ratified by a majority of the Chapter Presidents voting on the amendments. The Chapter Presidents voted on behalf of their Chapters. ALA’s bylaws state that “Chapters may not set membership criteria that are either more restrictive or less restrictive than those of the international Association”. As both of the amendments affect ALA’s membership criteria, their passage required revisions to chapter’s bylaws in order to be in compliance. Changing the criteria for student membership: This amendment more clearly defines who is eligible for a student membership, in addition to setting limits on the number of years someone can be a student member. ALA members who qualify for student membership are Associate Members of the association. Allowing legal consultants to be regular members of ALA: This amendment broadens membership by opening up regular membership to individuals who a) would be membership eligible if they were paid by a firm instead of an outside party; or b) are leaders in the business of law and work side-by-side with administrators and partners to improve processes and governance in our firms (legal consultants). The Chapter revised the membership section of our bylaws to reflect the change and be compliant with ALA International, then opened voting on the amendment to the membership. The amendment passed with 91% approval. Click here to view the updated bylaws. April 2: World Autism Awareness Day, created to raise awareness of the developmental disorder around the globe. April 14: Vaisakhi (also spelled Baisakhi) celebrates the founding of the Sikh community as the Khalsa (community of the initiated) and the birth of the Khalsa. April 15: Ram Navami, a Hindu festival commemorating the birth of Lord Rama, a popular deity in Hinduism. People celebrate the holiday by sharing stories and visiting temples. April 15: Day of Silence on which students take a daylong vow of silence to protest the actual silencing of lesbian, gay, bisexual and transgender (LGBT) students and their straight allies due to bias and harassment. April 21-May 2: Festival Of Ridván, Bahá’í. Annual festival commemorating the 12 days when Bahá‟u‟lláh, the prophet-founder of the Bahá‟í Faith, resided in a garden called Ridván (Paradise) and publicly proclaimed His mission as God‟s messenger for this age. The first (April 21), ninth (April 29), and twelfth (May 2) days are celebrated as holy days when Baha‟is suspend work. April 23-30: Passover, a Jewish holiday celebrated each spring in remembrance of the Jews’ deliverance out of slavery in Egypt in 1300 B.C. On the first two days of Passover, a traditional Seder is eaten and the story of deliverance is shared. April 24: Armenian Martyrs’ Day recognizes the genocide of some 1.5 million Armenians between 1915 and 1923 in Turkey. The Branch section invited Sarah Ragland, Compliance Officer at Nixon Peabody LLP to join the March meeting and to lead a discussion on client expectations for compliance, security and privacy. Increasingly, clients, particularly those in the financial services industry sector, require their outside counsel to respond to an audit of capabilities, policies, procedures and capabilities as related to securing and handling client information. While many firms have made significant IT infrastructure investments, rewritten policies and comprehensively trained their attorneys and staff, a client’s audit can still be an exacting and revealing test for the firm. Compliance encompasses physical security, records management—both physical and electronic—and the policies and procedures governing behavior toward security and privacy. Compliance is both focused on risk management and client relations; there are legal requirements to be met, and then client requirements that are often more stringent. In most instances a client’s requirements of their outside counsel are a reflection of the requirements placed on the client by industry regulations or the demands of their market. At one level, compliance is demonstrated by the strength of passwords and the frequency with which they are changed. At another level, compliance addresses the transfer of firm data across international borders, especially where different standards for privacy come into play. In all cases, compliance includes an organization’s definition of and response to a breach of security. Compliance can be expressed in a firm’s rules for professional conduct, or the management of health related information under HIPAA or financial information under Gramm Leach Bliley. The scope of compliance easily stretches into areas of risk such as corruption and money-laundering that may at first seem extreme, but which should be included in any comprehensive approach to compliance. With a large number of competing and overlapping requirements for compliance, it is critical that the approach for implementation is practical. There is a point of balance for a firm’s management to determine between security and convenience, between affordability and ensuring client confidence, and between long-term comprehensive programs and actions providing immediate impact. Determining a practical approach to the policies, procedures and systems underpinning compliance must include practicing attorneys, not only because they represent the clients’ requirements but because they must set or accept the balance between risk and control. Compliance is typically addressed on a scale of complexity and rigor; perhaps at a basic, acceptable level, essentially instituting an environment of controls and a degree of risk that is simply defensible. Or, perhaps, the level selected is all encompassing, driven by a standing committee of attorney leadership, with systems delivering tight controls on every acquisition and transfer of information. Regardless of the level chosen the starting point must be that current information management practices, whether professional or personal, are most likely inadequate. For example, the use of USB (thumb) drives to transfer data is a common action but is also a recognized risk that has led to policies requiring all such drives to be encrypted or password secured. The co-existence of personal and firm email accounts on the same computer has more recently been identified as a risk, leading to the blocking of access to non-firm email sites. The practical implementation of compliance is not just systems such as locks, video-monitoring, and IT security; it is also knowledge and behavior. The requirement for knowledge and behavior is met through documentation and education, whether focused on the correct identification of a covered entity or the appropriate response to a breach of security. Comprehensive policies describe the aspects of the firm’s business subject to compliance controls, detailed procedures supported by mandatory training provide direction on behavior, both what is required and that which creates risk. Training must be mandatory in order to establish a firm base of understanding and control, and training should be progressive because not all required changes in behavior can reasonably be achieved in one effort. While some controls can be automated, other aspects of compliance require personal judgment, a skill that must be highly developed especially when evaluating the degree of risk in managing records or whether a breach in security has occurred. At this point in time, compliance implementation is typically a customized approach for firms; however there is a standard from the International Organization for Standardization, ISO 27001, which provides a framework for information management security, and for which certification to the standard may well become an imperative for law firms. More information on this standard can be found at http://www.iso.org/iso/iso27001. While the role of Compliance Officer is essential to build and drive a firm’s compliance program, inevitably the success of the program hinges on the behavior of the attorneys and staff. Small changes such as being alert to unauthorized visitors in work areas, maintaining a clear desk outside work hours, creating complex passwords, or simply tidying papers in a conference at the conclusion of a meeting, all contribute to reduced risk and increased compliance. In making such changes to our behavior we can begin the journey toward a more secure work environment. ​Glass vs. Drywall: A Dispatch from the Frontlines. Project Manager, HITT Contracting Inc.
“Hey, Who Stole My Walls?” If you’ve moved into a new space in the past decade, you’ve probably found yourself asking the same question. Why? Well my friend, glass and drywall are locked in a battle of epic proportions. It’s been a long, drawn out battle and many walls have been lost. Modern offices are increasingly trading in their traditional walls for glass. In the next few paragraphs,I will boldly attempt to make sense of it all using the following points: glass vs. drywall, daylight harvesting and which demountable system is right for our firm? Trading Faces – Drywall vs. Glass; where to begin? Drywall is permanent, impervious to light, traditional, and a barrier between two people. Glass is reusable, pervious to light, modern, and a window between two people. There are distinct advantages to both; however the new normal is glass office fronts. But why, you ask? Blame omnipresent social media, modern thinking or 24-hour news cycles - we place a high value on knowing what’s happening around us. Glass allows us a window into the world of others and we have begun to cherish this new open sense of community. 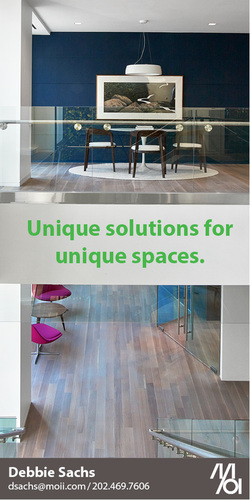 Glass is not just a fad or trend, but a paradigm shift in work spaces. Simply put, glass fronts are here to stay. Harvesting daylight for twelve hours a day can really wear you out! That’s a joke, but in days’ past, people who didn’t have perimeter offices would have to exit a building for a glimpse of elusive daylight. One transformative solution is the Glass Demountable Partition (GDP). Simply put a GDP is a glass wall that can be disassembled, thus making it ‘demountable’. When deployed as office fronts, demountables allow light to penetrate deep into the building. This aspect of daylight harvesting has proven to increase productivity and offset the amount of electric lighting needed to properly light a space, which reduces energy consumption (read – saves $$$). This is a devastating blow to drywall – hence these new ubiquitous glass walls. Maybe you’ve been through this already, maybe not, but at some point you will hear this question asked - which demountable system is right for our firm? That is a loaded question, with numerous systems available – Unifor, Adotta, IOC, Transwall, Muraflex, (to name a few) - the choices can be daunting. How then do you make a decision? Well in my experience the three main decision making factors are: look/aesthetic, cost and schedule. Look / Aesthetic: Q: Which system does your firm think looks the best? A: Tour other firms, reach out and touch the product and see it in an office setting. Then take your collective experiences back to the boardroom for decision making. Cost: Q: How much does each system cost and can we afford the one we want? A: Engage your preferred general contractor to develop lineal foot costs for each system and an overall cost per system. Compare costs to budgets to get the most bang for your buck. Schedule: Q: When do we need it and how long will it take to produce? A: Engage the GC to develop timelines. Each system has a distinctly different delivery method. A typical time line is as follows: subcontractor>release> shop drawings / submittals> field dimensions>fabrication>delivery>install. Make sure you pick a system that fits your schedule. In closing, don’t let the battle between Glass and Drywall cloud your judgment. On several HITT projects where our team has swapped drywall for glass office fronts, the Client's resounding response has been positive. If you find yourself needing help with any of the above, please feel free to contact me directly at (703) 942-5408 or wsmith@hitt-gc.com. 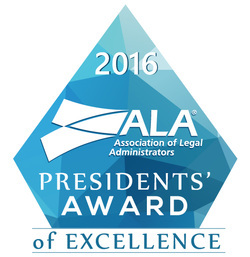 ​The Capital Chapter is pleased to announce that our Chapter has been honored with the 2016 ALA President's Award of Excellence! In the beginning of my career I was in charge of a Russian group in London attending a medical conference. We requested an English/Russian translator. The morning of the conference a beautiful young Vietnamese young woman walked in looking for me. My Biggest surprise is when she introduced herself as our translator. My own assumption and perception of a Russian looking translator (Whatever that means) didn’t materialize when I saw the Vietnamese translator. I kept thinking about my reaction, I asked myself why didn’t I even visit the idea that many people speak more than three languages (I speak five). It is not till years later that I was able to put a name to my assumptions: My Unconscious Bias. So what is Bias, and why should we care about it? First let us start by saying that most people that have bias do not do it on purpose, it is unconscious – It is a blind spot that requires a shift on how we think about other people that we perceive different. It is a belief or attitude in our heads. Bias is the very fundamental way we look at and encounter the world to make sense of the world around us. It is driven by the hard wiring pattern of making decisions about others based on what feels safe, familiar, likeable, valuable and competent to us without us realizing it. Bias is an inflexible positive or negative conscious or unconscious belief about a particular category of people. Our Bias kicks in whenever we have a perception of threat to our own survival or a threat to our physical or property safety, identity or sense of being. It is an instinct reaction as primal biological urge response that brings relief to tension (Human beings developed these instincts since the Caveman era). Bias is the ability to distinguish “safe” from “Dangerous” which is a basic quality of our human brain to categorize and group information so our brains can make sense of them. Why does our brain do that? At any given moment we group people, and situations into categories so we can make decisions about our world. Bias is the filter or group of filters that this multitude of information sips through. We are exposed to almost 11 million pieces of information at any one time, our brain can recognize ONLY 40 of them or so, and can focus on about 5-7 at a time. Pre-established filters – are perceptions, assumptions, interpretations or preferences that we develop throughout our life experiences developing conscious and unconscious Bias as a result. So where do we get our initial filters or Bias: Our first point of contact right after we are born are our parents, who expose us to their beliefs, values and cultures, then family members, schools, teachers, religious institutions and our own life experiences. If any of the above exposures has a blind spot it is transferred to us and they become our own blind spots that we in turn transfer to the next generation we come in contact with. Acting on Bias is NEVER positive even if based on positive content as it keeps us from seeing people as individuals for example assuming that all Asians have high income and drive BMWs. Our unconscious Bias is our blueprint ping through life, it is important to mention that it is normal that we ALL have some degree of bias no matter how open minded we think we are. The problem with Unconscious Bias is that unconsciously we divide the world into the world of “US” and the world of “THEM” distancing others that are different from us just because they fit into a certain category or group that exist only in our minds. This is part one (1) of this post- in part two (2), will discuss why should we care about Unconscious Bias at the workplace and how to manage it. ​On March 24th, the Capital Chapter celebrated the Change of Gavel at the St. Regis. Chapter members and Business Partners gathered to thank the outgoing Executive Committee and Leadership Team, welcomed the incoming officers, and honor the 2016 President's Award recipient. Outgoing Chapter President Beth Fowler's remarks highlighted the importance of volunteering. Specifically, Beth highlighted the Capital Chapter members who volunteered over the past year to be Ambassadors or serve on the Diversity & Inclusion Committee and thanked them for their service. Beth concluded her remarks by encouraging members to get involved. She explained that "the rewards of volunteering far outweigh the time commitment," and challenged members to "get up from behind that computer screen and find a volunteer opportunity that is a fit for you." The Chapter presented a donation of $5,000 to the Capital Chapter Foundation in honor of Beth Fowler. The donation was accepted by Karen Laumoli, Foundation Treasurer, on behalf of the Foundation. The donation will help to fund the 2016 Toni K. Allen Scholarship. After accepting the gavel from Beth, Incoming Chapter President Barbara Mannix took to the podium and expressed her hope that her term would be "marked by inspiration, leadership, compassion, and most of all a healthy sense of humor." Barbara has already made strides toward the leadership aspect of that goal, working with the Education Committee to schedule nearly a full year of incredible programming. The Chapter is looking forward to what the coming Chapter Year will bring under Barbara's inspirational, compassionate, and perhaps humorous leadership. Congratulations to Jenna Carter, the 2016 President's Award recipient. As Vice President of Community Services, Jenna worked tirelessly to engage volunteers and promote the Chapter's commitment to giving back to the community. Her term was a busy one, and her projects included producing College and Career Readiness Workshops for high school students in conjunction with the YMCA, fundraising creatively for the Toni K. Allen Scholarship, and coordinating the Chapter's Angel Tree Program participation. The Capital Chapter is extremely grateful to Jenna for all of her hard work and commitment, and is proud to recognize her as this year's award recipient. April 22nd is Earth Day! Use easy document scanning/emailing instead of faxing or mailing documents. This will not only reduce paper, but could also reduce your real estate costs by reducing onsite paper storage needs. 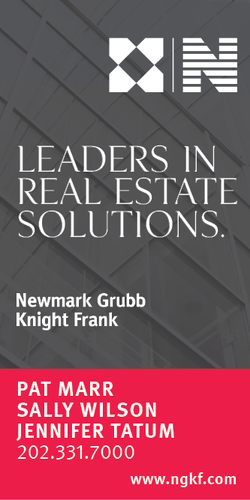 ​To find out how to get the full value for real estate savings through greening your lease, reach out to Jennifer Tatum at Newmark Grubb Knight Frank at 202-312-5771. Happy Spring! As the seasons change from Winter to Spring, I’m reminded of an article I wrote for this newsletter back in 2014. The article started off with: “The only constant in this world is change.” Again, that phrase has never been truer than it is now. The office supply industry has changed dramatically over the last 5 to 10 years and is probably going to experience another big change if the FTC agrees to allow the Office Depot/Staples merger. Look at the number of national office supply dealers you had back in the year 2000. Staples, Office Depot, Office Max, Corporate Express, US Office Products and Allied Office Products were all national suppliers competing in the DC legal market for your business. Six large, healthy companies competing for your business driving prices down and services up. That’s what competition does, right? Drives down prices and raises service levels. Most people who are in the know agree that in the next six months, there will only be one national office supply vendor, Staples. For those that have been following this trend in the news, you know the FTC is concerned the result of this merger will mean higher prices and decreasing service at the national level. We all learned in our college and high school economics class that less competition means higher prices. We can all see it coming; many of you have already experienced the pain associated with the Office Max/Office Depot merger with pricing and services. The expectation should be that this is going to continue when there is only one national office products supplier. It’s not all bad news. There is a channel in our industry where competition is prevalent. That is the local independent office supply dealer community. We live and work in a market that is extremely different than most places in the country. We’re home to the Federal Government which requires and attracts a huge number of professional workers to sustain it. Our industry requires professional workers to prosper and DC has a lot of them. The result of this is several very competitive, healthy independent dealers. We compete on a daily basis to provide you with competitive pricing and we are constantly rolling out new services. Each of us has increased our investments in technology to provide you with first class e-commerce platforms that I would argue are better than our national competitor. We constantly compete with each other on pricing, resulting in the lowest office supply pricing in the country. We each have local customer service that delivers a personalized experience, no 1-800 number level of service. Tired of having all of your products dropped off at the front desk by the national company? Local dealers employ their own distribution staffs who are happy to put your products where you need them, not where it is convenient to dump. The only perceived benefits of a national company are the ability to have uniform pricing at every office, have a common platform for ordering products and one source for reporting and invoices. Each independent supplier in the DC market has the ability to provide all of those perceived benefits. Diversity is being invited to the party; Inclusion is being asked to dance. Law firms are the toughest battlegrounds when it comes to diversity and inclusion initiatives. If the leadership of your firm is not committed to diversity and inclusion, you might as well just focus on planning the holiday party. These are just a few of the insights that Terri Easter shared in her presentation on March 31. Terri, a former Capital Chapter member who was the first African-American COO of an AmLaw 100 firm, has over 25 years of experience in Diversity & Inclusion programming in corporate, banking and consulting. Terri discussed how to make the business case for diversity. With diversity comes effective leadership, a strong brand, best-in-class products and services, and strong employee engagement. In order to have diversity, you must have diverse leaders. Gender diverse companies outperform financially by 15% above the median; ethnically diverse companies outperform financially by 35% above the median. But diversity is not just about race or gender, there are a multitude of factors at play. Many firms have affinity groups, but that is not inclusion, and in fact can be detrimental to inclusion efforts. Terri gave us many tools for sustainable diversity in our firms. Firms should consider leadership development coaching, because they must have leaders who are committed and vested in having a diverse workplace. People need to understand that their business behavior may need to be different from their personal behavior in the workplace. They must expect themselves and others to embrace biases and change their behavior – not their hearts or thinking. Firms should fill openings with diverse people who have been successful at other organizations. It is important to remember that people make a decision about an organization within the first 90 days, so be sure to use people who have been successful at your firm to mentor new hires. Sponsorship matters, and is proven to make a huge difference in the retention and success of all employees. And be sure to measure employee engagement – Gallup has a great 12 question survey that is very useful. After spending 90 minutes with Terri Easter, we all came away with a new awareness, and many tools to take back to our firms. It was clear from the questions and discussion that most firms continue to work at having a diverse and inclusive environment, but are not there yet. But thanks to Terri, we have new tools to help us help our firms move in the right direction. ​Chatting with vendors at conferences can provide more insights than you may realize. Legal conferences are great opportunities to learn about trends in the field and new technologies. Surprisingly, one of the best ways to do this is to talk to legal tech vendors. You may think that speaking to providers is a surefire way to get a sales pitch you don’t want; however, it can actually help you get more out of the conference. After all, it is in vendors’ best interests to stay up-to-date on new developments and key influencers in the field. ​Here are some ideas to keep in mind the next time you attend an event. 1. Engage with vendors. Even if you aren’t looking for a new provider, vendors would love to talk to you about anything – from the future of technology to great restaurants in the area. You might learn something unexpected or find your new favorite lunch spot. Most won’t try to sell their products halfway into a pleasant conversation, as they can likely use a break from their spiel, too. 2. Ask for something that seems unlikely or difficult to do. You might be surprised by what a vendor can do – or they might even implement your suggestion into their product. 3. Ask a vendor to meet you in a place other than an exhibit hall, like over a meal. They understand that you’re short on time, and they probably like Shake Shack burgers as much as you do. 4. Spend time outside of sessions. Sure, panels have a lot of education and networking value, but the same can be said for hallway conversations hallway conversations (hence the popularity of “unconferences”). Find your preferred way of interacting – whether one-on-one or in large groups – and make it work for you. 5. Do some informal research on vendors beforehand, if you’re actually looking for products. A simple top three list of booths to visit or people to meet can help you make the best of your limited time. You never know if your conference experience could be cut short by a flight delay or a snowstorm, like at last year’s Legaltech New York! 6. Interact on social media. Conversation happens not only in the halls, but on Twitter and mobile apps as well. Both attendees and vendors will be online sharing everything from session recaps to curious sightings, so it’s a great place to discover happenings and to join conversations. 7. Use vendor interactions as an opportunity for advancing your career or promoting your firm. Many publications and vendors look for insightful quotes from attendees for blogs or articles. Not only does a quote from you help us, it can get you exposure to new customers or peers. It’s a win-win! 8. Vendors are just like you. They’re looking to have a great conference, engage in conversations, and meet new people – whether in the exhibition hall, at an educational session, or over coffee. Ultimately, they’re people, not selling machines, and certainly not the enemy. ​Conferences aren’t just about avoiding vendors practicing a sales pitch. They’re also about connecting with people, learning about the latest trends, and having fun. You might be surprised to find that connecting with vendors can actually help you do that. Try out these tips at an upcoming conference to see how they can improve your experience. Reprinted with permission from the March edition of “Legaltech news”© “2016” ALM Media Properties, LLC. All rights reserved. Further duplication without permission is prohibited, contact 877-257-3382 or reprints@alm.com. IT Security for Law Firms - April Fools? Can You Tell the Pranks from the Facts? Cyber pranks seem obvious, but the Crypto Locker virus is very real. And it’s surging, again. The Wall Street Journal reported firms Weil Gotshal & Manges LLP and Cravath Swaine & Moore LLP, which represent Wall Street banks and Fortune 500 companies, in multibillion-dollar merger negotiations, to intellectual property and other private litigation, were hacked last week. Other law firms were also breached according to the report. What were they after? Or more importantly, how do you protect your network and guide your law firm? Last week, NPR reported a great story from New York’s NASDAQ trading floors. Imagine hacking into one of the Stock Market’s trading systems. Yes, they’re vulnerable, too, and it happened to the NASDAQ in 2010. Nasdaq’s Louis Modano, Sr. VP, Chief Information Security Officer, has an entire team of “good guys in sneakers,” undergoing a task called red teaming, or ethical hacking, who act independently from the core IT team, to detect network and system vulnerabilities and test security by taking an attacker-like approach to system/network/data access. 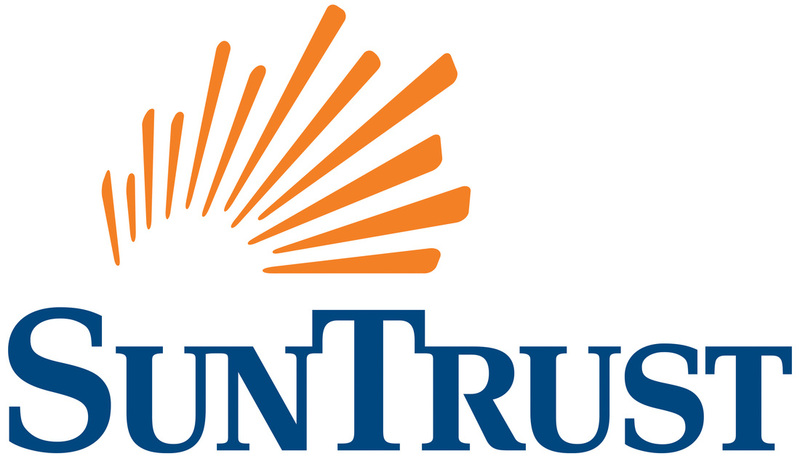 Companies should use such third party security companies to test vulnerabilities into the law firm. Red teaming, as it is called, is a task to look for gaps in your processes and IT infrastructure. How does it work? Well, they attempt to come in unnoticed to see if they can compromise a workstation, a server, any device really, or to compromise a set of credentials, etc. Once complete, you’ll get a report telling you they were able to accomplish, so you can tidy up your security policies and defenses to help prevent real threats. Marco Maggio, Director, U.S. Legal Practice, Konica Minolta Business Solutions U.S.A., Inc., shared how law firms have become a “treasure trove” of valuable data waiting to be hacked. As a result, corporate clients have started placing an ever-growing list of demands on law firms that have their data, to prove it is and will be secure by mapping to NIST frameworks like ISO 270001. No longer is it commercially acceptable to tell your clients that their data is safe because your IT department claims it is. This applies to all sizes of firms. 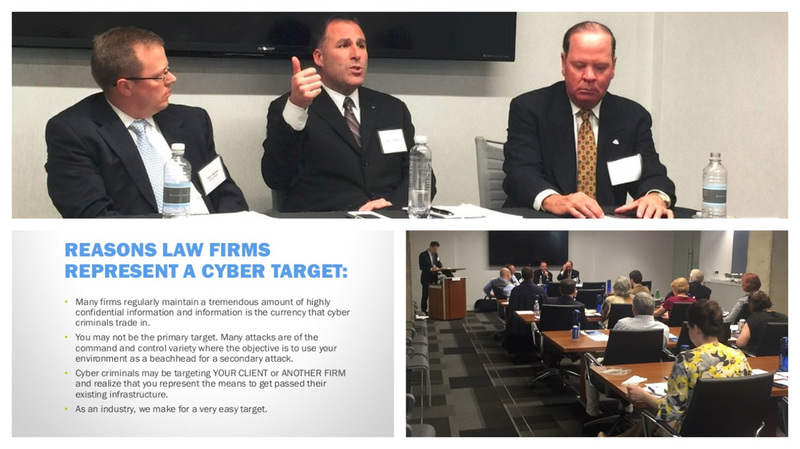 It’s the value of the clients’ data — and not attorney’s count — that drives the need for higher levels of security and attestation. Next, Jeff Snyder, Vice President, Cyber Programs, Raytheon Company highlighted The Presidential Policy Directive (PPD) on Critical Infrastructure Security and Resilience. It advances a national unity of effort to strengthen and maintain secure, functioning, and resilient critical infrastructure. The directive identifies 16 critical infrastructure sectors. “Who are the owners and operators,” asked Jeff. They are commercial companies, many of whom are clients of your law firm. 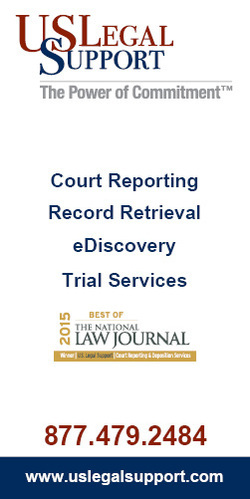 This raises the bar for law firms to have a better framework to exercise better care of their client’s data. Steve Herbes went on to talk about this increased demand, along with companies now seeking to have indemnity. Corporate counsels are even asking for the law firm’s lists of vendors it uses. Take for example if one uses Google’s Gmail for your personal email. Gmail uses customized advertisements which may be well and innocuous to most of us. Well, if you’re also viewing a client’s health care-related matter via the firm’s email, you’ll likely see in that Gmail a suggested advertisement for some health care solution. Are you now violating HIPPA rules? Take a look how Google defines confidentiality in their terms and conditions. You may no longer be exercising due care with regards to Rule 1.6 (c). You may be shocked how Google defines indemnification. Ransomware activity has certainly spiked up over the last several months. How are these firms being exploited? Well, it comes down to starting with the basics: poor password hygiene, for example. Firms should adhere to policies and guidelines which help employees update to more sophisticated passwords, as well as have them automatically set to expire so users have to pick new ones. Have one of your team members help less technical employees in changing theirs. ​Another issue causing havoc is one wrong click on what appears to be a nonthreatening “unsubscribe” link. These can release hounds of hell into your network. One way to guard against this is to use an email protection service that re-writes all of the URLs within messages to a secure link. The secure link allows the service to perform scan-times and click-times, or analysis, first when the message is received, and each time the URL is clicked. For example, if a message is scored as “Medium Risk”, and the administrator has chosen to “Warn and Allow Click-Through”, the user is taken to a warning page detailing the risk, providing a thumbnail snapshot of the site, and given the option to continue onto the site. Denied sites will return a denial. Education is the starting point. 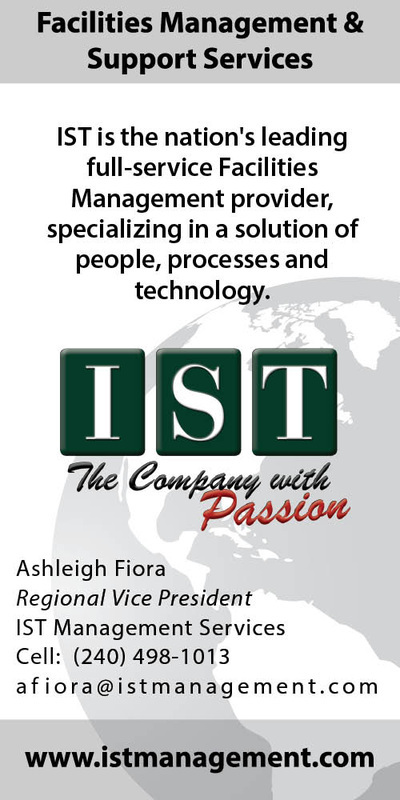 Then seek professional help from an IT services provider who truly plays in the legal space. How do you know if they do? Ask them if their help desk can field a question about your legal applications, like Worldox, iManage, Netdocs, Workshare, etc. All Covered offers these solutions along with other items shared throughout this post including Mobile Management Security, mapping to various ISO and security standards, vulnerability assessments and penetration tests. If you need help, I’m here to help. Many thanks to the members of ILTA, and ALA who attended, as well as to ILTA’s Jill Dietz, ALA’s IT Committee Chair and Co-Chair’s Kenny Mitchell and Frank Schipani respectively. Thank you panelists: Jeff Snyder, Steve Herbes, and Marco Maggio. The wait is over! 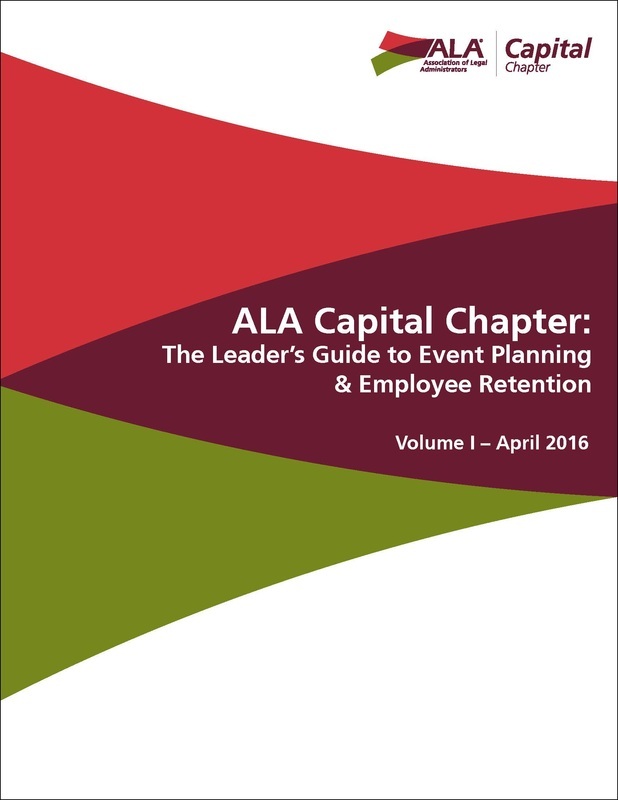 Purchase your copy of The Leader’s Guide to Event Planning & Employee Retention today! 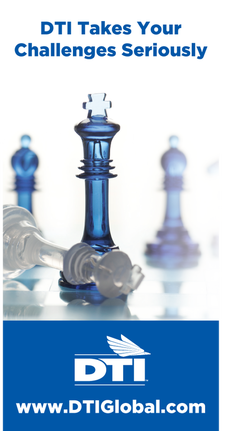 The book includes data from members on topics including events, morale-boosters, employee benefits and more, all compiled into one easy-to-read electronic reference guide. The data is even organized by law firm size for added convenience! Supplemental data, tips and tricks, and member recommendations on everything from event venues to Staff Appreciation gifts add even more value to the guide. And at only $25, this eBook is a steal! Creativity often slaps you upside the head like a villain from a 60’s Batman television episode when you least expect it...SMACK! It was reported that Einstein would sit in the bathtub for hours until inspiration hit. 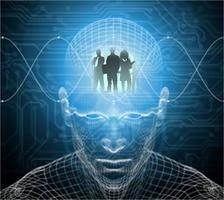 Based on my own personal experience and study of the topic, creativity happens between your thoughts. It may come when you are actively thinking, but it is usually during the pause in thought when it strikes. All of a sudden the mind finds that last puzzle piece and puts together the concept or question without even our full participation. We are often left wondering, where did that come from? Many of today’s brightest and best executives and professionals around the world desperately want more creativity and yet struggle achieving it. This is primarily because 1) chronic stress and 2) a racing mind bombarding them with thoughts all day long, which prevents the space or pause necessary for the creativity to arrive. 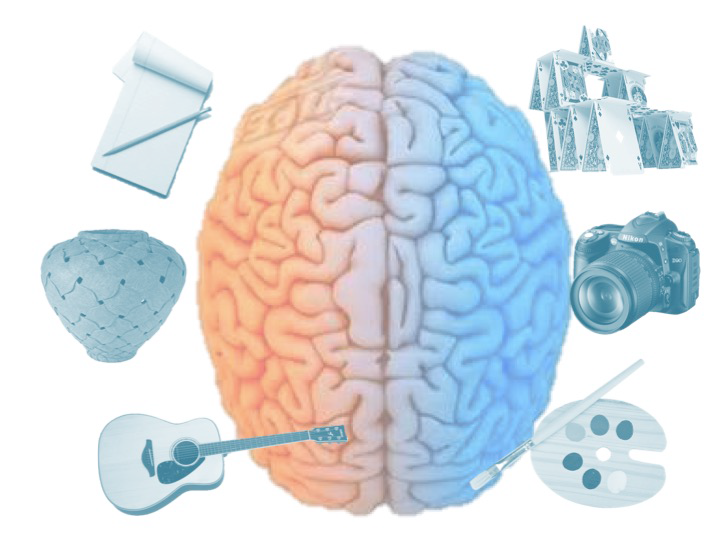 This article is going to explore how to calm the mind for increased creativity and also give simple activities you can do to reach your creative genius! Your brain is not your mind. The brain is the hardware and the mind is more of the software. Daniel Segel M.D. gave an even better definition for the mind. ‘An embodied process that regulates the flow of energy and information’. Embodied means that what happens in the mind is simultaneously experienced in the physical body. Deepak Chopra estimates that we have 68,000 thoughts per day. Research shows that 90% of those thoughts are negative in orientation…and you had yesterday! It’s as if we each have our own Top 10 sad-sap playlist on repeat going through our heads day after day. Now that’s a lot of competition for creative space in the average professional’s mind. Why does that happen? Repetitive thoughts can be a product of the law of facilitation, a neurophysiologic principle that states when you have a thought it is like walking through a field of untouched high grass. When you have that same exact thought again you walk down the same path through the field and it strengthens the connection between the brain cells. If you continue having the same thought and walking that same path ultimately you will create a visible worn trail in the grass. The very same thing happens in your brain and it becomes engrained! When this happens you will have that thought more frequently and it will stay with you longer because the brain circuitry and neural network that wires together, fires together. One reason we have so many negative thoughts is because the brain has a negative bias for survival purposes. The mind is where stress begins and happens when we perceive a threat. Back in the day, it was physical threats (animals and tribes) that the stress response was designed to protect us against, but today our mind and body will prepare us to fight-or-flight just the same from perceived emotional, financial, social, mental, and professional threats. Our negative thoughts elicit matching emotions as well as a stress response that prepare our brain and body for a life-or-death situation…even if it is only bills, taxes, a first date, or public speaking we are worrying about. To put this into perspective, it’s estimated the average professional has 17 to 19 stress responses each day! Stress activates the sympathetic branch of the nervous system that causes us to become left-brain dominant. Our left-brain hemisphere is connected to doing what we've always done, using previous knowledge, and linear/logical/mathematical thought. It is not smart for survival to perform a cartwheel while running from danger...when you are stressed your body-mind shuts down creative and novel ideas. Stress is a major cause of your creative block. Stress not only cramps creativity, but it leads to a jumpy and racing mind. When any of the five factors above are out of balance it will create biological (instinctual) fear because the needs of human survival are not being met. Since the mind cannot be separated from the body, these imbalanced lifestyle threats to our health will cause a stressed and hyperactive mind. Professionals that regularly ignore their body’s signals (hunger, thirst, fatigue, bathroom, love, etc.) become trapped in their head and can’t calm their mind for creativity. A calm mind begins with meeting the basic human physiological needs. Also imbalance of any of the above five factors will release a stress response that always includes a spike in blood sugar. Rapid blood sugar rising and falling leads to hyperactive cognitive behavior and decrease in serotonin (more negative thoughts) levels. That means that an imbalanced lifestyle filled with stress will have you acting and thinking like a child revved up on Pixie Stix and Mountain Dews. I hope you can see by now that becoming your most creativity self isn’t hard, torturous work at all. It’s fun, happy-making, health-promoting, and in many instances brings out your curious, playful inner child that was always creating! When we grow-up, stress-out, stop dreaming, quit playing, abolish fun, and ignore our body’s health needs our creativity comes to a screeching halt. Only you can take your creativity, career, health, and life into the express lane and I am here to guide you over with my 21-Day Creativity Invitation. I invite you to pick up to four mind-calming and/or creativity-building activities from my list above and perform at least one every day for the next 21 consecutive days. I wish you 21 days of light bulb and aha moments as you also experience a calmer mind and daily enjoyment with your own combination of activities! Based on member feedback the Capital Chapter is forming a new Finance Section. We are seeking active members to helps us get this group up and running in 2016! Please join us for our first round table session on April 19th. This meeting will be aimed at collecting input on the needs of our members. Specifically, what issues are you facing within your firms that we may be able to help address together. Topics may range from reviewing new time and billing systems to tax filings and matter budgeting solutions and anything in between. But your input is needed!